Summer is here, and the weather is as well. On these hot days, the local parks are a bit torturous to visit. If you’re looking for a place to go, why not head to the beach. 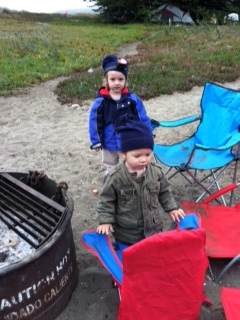 There are many great beaches out there waiting to be enjoyed by little explorers. 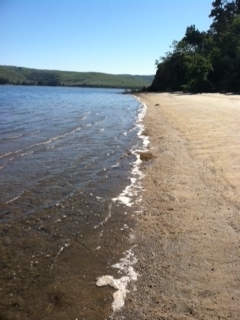 Last summer, I was in love with visiting Salmon Creek; this year, Tomales bay. Without crashing waves, these beaches are ideal for tots. Situated on a gentle bay, these beaches are completely kid friendly. In fact, one of the beaches, Hearts Desire, even provides shade on sunny days. Although a bit of a drive, Hearts Desire beach is well worth the trek. With a parking lot steps away from the shore, it is a convenient option. Bring $8 (cash or a check) for the parking fee. There are decent bathrooms so pregnant moms and potty trained kids don’t have to worry about finding a restroom. With BBQ pits and a grassy area, this beach offers space for group gatherings. 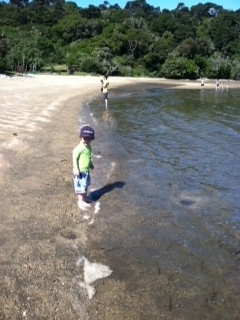 Ideal for explorers of all ages, the water at this beach is calm and shallow. Young explorers can look for small crabs, seaweed and seashells! Older explorers can walk to deeper water and swim out to a floating platform. The sand, perfect for castle building, encourages tots to spend hours creating whatever their imaginations desire. Last week Bobby and I used diggers to build a road for race cars. We decorated it with flags made from seaweed and trees made from acorns. If your tot is a boat lover, then you are in luck. Bobby has spotted sailboats, kayaks and canoes at this spot. If your tot likes to roam, then check out one of the short hiking trails around the beach. You can bring a picnic or grab goodies on your way. Why not grab a bag of oysters at Tomales Bay Oyster Company? You can shuck them when you get to the beach. Prefer to grab a snack after your beach adventure? Then, drop by Point Reyes Station. There are a few darling kid friendly cafes to visit. Consider stopping by Café Reyes home to a kid friendly patio. Relax on the patio while enjoying fresh oysters and wood fired pizza. Then enjoy a leisurely drive back home. If you’re lucky, your little one(s) will snooze on the way. This entry was posted in adventures, beach, day trip, sonoma, tips, Uncategorized and tagged adventure, beach on June 18, 2012 by Modern Mama.